The Trilobites for sale here are an ancient variety of arthropods, some as old as 550 million years. They are one of the first animals to have eyes. 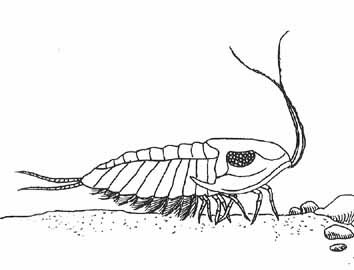 Many species have compound eyes that are easily seen in their fossils. These funny little bugs are just plain appealing. They are the most popular of the invertebrate fossils. There are thousands of species to collect. From the Elrathia kingi, to the Flexicalymene these extinct sea creatures always appeal. You can choose small flat specimens or rolled into a tight protective ball. Occasionally youll even find one in a half-curled position as if it were crawling over a rock. "The fossils I purchased from you arrived safely today. I am very pleased with them. The trilobites are indeed cute. Students will enjoy seeing them. Thank you for carefully packaging and promptly shipping the fossils to me." The first trilobites show up in the fossil record early in the Cambrian Period about 550 million years ago. They were on the vanguard of the "Cambrian Explosion", a time when many animals had hard body parts that could fossilize. They get their name from the 3 lobes of their bodies from side to side. There were also 3 sections to their bodies from front to back, the hear or cephalon, the body or thorax, and the tail called the pygidium. The thorax was very flexible. Trilobites could curl up into a ball to protect their bellies like a sow bug. They rapidly diversified through the Ordovician Period and were abundant. However something happened during the Ordovician Period that was not good for the trilobites. It may have been a change in the earth's climate like an ice age. Whatever it was many species of trilobites became extinct later in the Ordovician. Their numbers continued to decline during the Paleozoic Era. They finally went extinct during the Great Dying of the Permian Extinction.